In more ways than one, Jonathan Amon's career arc has been repleted with a lot of intrigues and interesting caveats. Right from his teething years as a football pro, the 19-year-old winger has had to make a lot of tough decisions even at such tender years, and that includes having to part with his family for long periods. "It's not easy," he had once enthused. "I only see my family twice a year. In the beginning it is very tough. Born in South Carolina to a Nigerian father and an American mother, the young winger started playing football first for local sides Summerville Soccer Club and South Carolina United Battery before a Nordsjælland scout spotted him playing for Kies School in Denmark. There is a strong indication from the States that the Stars and Stripes management are already planning to include him for the upcoming U20 World Cup in Poland. Amon, 19, had also played with highly-rated teammates the likes of Schalke O4's Nick Taitague, RB Leipzig's Tyler Shaan Adams, Paris Saint-Germain's Timothy Weah, and KAA Gent's Ben Lederman during their time in the U-14s. That has equally been backed up as well-informed American journalist, Adam Belz who told allnigeriasoccer.com's correspondent, Emmanuel Chinaza that the country's U-20 handler, Tab Ramos is planning to unleash the youngster against Nigeria in the group stages of the competition come May. 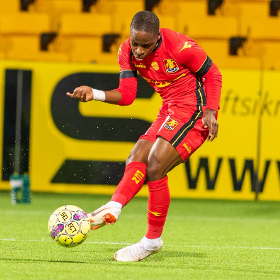 Even his club manager, Kasper Hjulmand was forced to describe the fleet-footed starlet as 'insanely good' after some really eye-popping displays in the Danish Superliga. Nigeria will face United States in their second group game at the U20 World Cup, of which the Amon could possibly line up in white to compete against the Flying Eagles, while their other opponents are Qatar and Ukraine.